2 Interactive works in the lobby of the new building. "Happiness Runs in a Circular Motion"
Turn the Activator to cause the upper sculpture to rotate and spin. Sky Writing II rides on a tilting base that centers the bird wings overhead as you walk below. Sky Calligraphy. While waiting for a train, you can activate the 20' tall Sunrise at Aurora City Station. Twirl it up! Everyone knows of the Butterfly Pavilion with its famous tarantula, Rosie, and steamy tropical interior. It now has delightful outdoor gardens and a new entry sculpture titled “Chasing Light” a comment on the quest for the light that plants, invertebrates, and humans share. A giant assembly of 5 interactive kinetic sculptures entitled “The Tree of Life” are exhibited in the Grand Staircase of the new Kaiser Permanente medical facility at Lone Tree, CO. The entire work is 80′ tall in the building and can be seen from the approach to the entry but is best experienced by ascending the stairs. The viewer can gently bring the artworks to life and they will continue their gentle motions long after departure. The individual pieces are titled, from the bottom to top of the staircase, “The Seed” The Leaves” "Glimmer” The Juggler” and “The Flower”. The five-level artwork was completed and ready for installation at the artist’s studio but fatefully was caught in the raging flood of the North St. Vrain creek on Sept 12th of 2013 in Lyons, Colorado. All was lost into the river and destroyed with the exception of “The Seed”. Kaiser Permanente generously and immediately came to the support of the artist and recommissioned the work to be made again. The one surviving sculpture was refurbished and placed on the garden level at the Lone Tree site in December of 2013. Nine months later, the artists’ studio and home were reconstructed and repaired. The giant interactive sculpture has been entirely recreated and can now be seen best by journeying up the “Tree of Life” using the staircase, and gaining some fitness in the process. The Heart Wall brings light and enjoyment to an otherwise dark hallway. The wheels are turned by passerby. We recently designed and installed three separate pieces of art for the City of Broomfield Health and Human Services Building in Lone Tree, CO. This kinetic, wind-activated piece sits outside the main entry and welcomes visitors. “Movement from Center” is a delicately balanced piece. This wonderful lobby installation is the final piece of art for the new building. It captures the light and sparkle from the windows surrounding it and is activated by guests in the lobby turning a dial in the reception area. The main lobby area has high ceilings and is overlooked by a sitting area above. A year long Kinetic Art Show in Boynton Beach Florida features the work of top sculptors from around the country. The Tangerine Glider was proudly presented in 2013. Blue Butterfly Tree - Internation Kinetic Art Show - Boynton Beach, Fla. 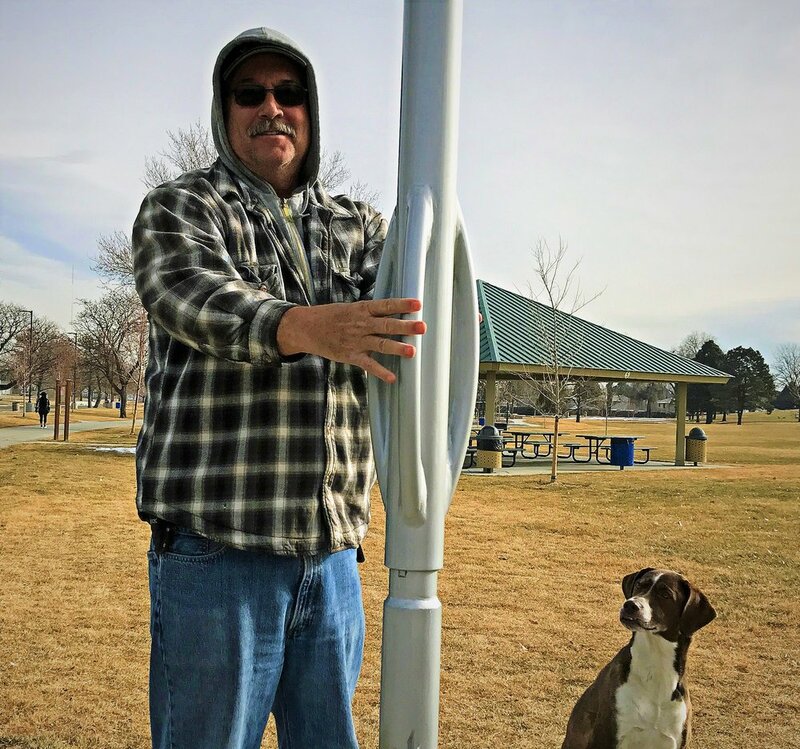 It has since found a permanent home in front of the new Broomfield Health and Human Services building in Broomfield CO. The Blue Butterfly Tree was created to be in the International Kinetic Sculpture Exhibition in Boynton Beach, Florida. Here it is in front of a Banyan Tree. This sculpture was created for the entrance to the Littleton Golf and Tennis Club and was installed in 2016. Referencing the basic form of a racket, the sculpture moves with grace and fluidity, much as a powerful tennis player would. Lotus Dragon, Torii Square Park, Westminster CO.
Westminster, Colorado, unveiled the rebuilt Torii Square Park and its featured kinetic sculpture, Lotus Dragon, by John King. 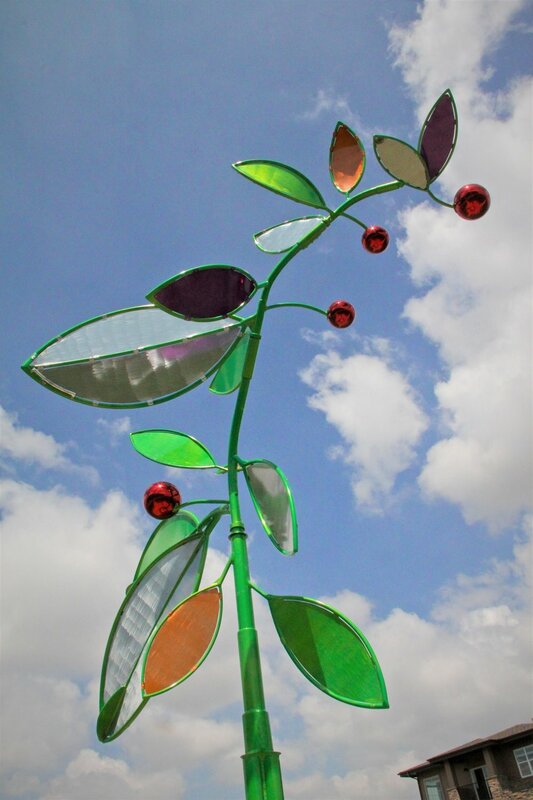 The piece is 22′ tall and is finished with bright red, magenta, silver and purple powdercoat colors. It appears to be a hybrid between plant and dragon and twists and tumbles in the wind. It carries a proud and festive air.